I have been reading all your blogs, but I haven't had a lot of time to post. : ( Miss Amelia keeps me busy. Very busy. Here is a picture of her at six months. I made this dress from the Leila and Ben Sweet Dress pattern. I added the lace insertion just because the piece of blue fabric I was working with wasn't big enough to cut the sleeves. It turned out to be a fortuitous problem because I really liked the result. My babe has decided that naps are for wimps. She often takes two 15 minute naps a day and that's it. She wakes up perfectly energized and happy though! That's why blogging has gone out ze window. I hope to get back to it more regularly though! We found out that the scary problem she had at four months was a reaction to her dtap vaccine. Scary!!! The hospital never even considered it to be a vaccine reaction even though I asked ever single doctor if it was a possibility. It took me googling to find out that she had an HHE (hypotonic hyporesposive episode). Her pediatrician concurred. Anyone else have a child with a severe vaccine reaction?? Levi is still a good and handsome boy. Well, he's handsome all the time and good most of the time. I think we need a Levi update soon! Thanks for stopping and reading! Have a lovely day! I was just thinking of you and hoping I'd see a post soon! 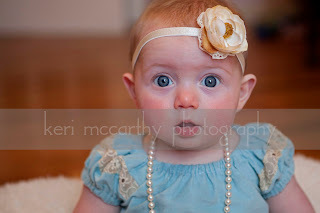 :-) Miss Amelia is absolutely precious -- those eyes! *melts* And her little dress is just darling (what a clever idea with the lace insertion). So glad to hear that you're all doing well! So glad to hear you are doing well! Amelia is so gorgeous! I love the idea for the lace insertion, I have a pattern very similar to that and I might have to try that. I had a bad reaction to the MMR vaccine as a child, so we are very cautious and slow in doing Evangeline's. Sorry you had to go through such a scary time. Amelia is beautiful, as is her dress! The lace detail is perfect. I'm glad to hear that you are doing well, even if she is keeping you busy! Amelia is adorable and that picture is amazing! Vaccines are always a toss up it seems. They make me nervous though none of my children have ever had bad reactions. I am so glad that Amelia is doing well now. It is so neat to see inside the world of a new mother...Amelia is a dear :) It will be fun to read further as the weeks and months go by. I happened to be visiting a few blogs to learn more for my blog, and am impressed that the Lord is raising up an incredible harvest of young people to serve the Lord through their family! I am grateful, for our culture desperately needs a renewed focus on the Almighty and His values.